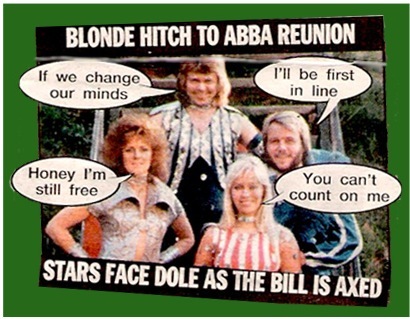 Blonde Hitch To ABBA Reunion! The UK newspaper -The News Of The World have made their point about the ABBA reunion joke. Comments : Comments Off on Blonde Hitch To ABBA Reunion! Before we go further with this, and before the horse has bolted for all the fans, we hold that the door to which Benny said to have opened when he was interviewed in the British Times, is at most, ajar. It was the respected British newspaper who reported the duo Björn Ulvaeus and Benny Andersson, during a call with reporters, suddenly turned upside down in all his years of intense denial and instead chose a more open reply to the question. It was not from the perspective of a new world tour – the quartet who once refused to do for seven billion – but was based on the setup of a smaller and more intimate event, with an orchestra and with the more mature material from the later discs. – I do not know if the girls sing as much anymore? I know that Frida has been in the studio. One answer enough to excite the most TOUGH fans – those who have heard rumours over and over again and always the same emptiness in the extension. – All of my Facebook page was full when I woke up this morning. I was just trying to reassure the public with “That’s the rumor we have heard before.” Then I saw that Benny had actually said something, “says Anita Notenboom, the founder of Abbas’s official fan club. – It would be epic, “said Michael Endelman, one of the editorial heads of the U.S. music magazine Rolling Stone, when the Express talking to him. – If they made a tour again, it could become one of the largest in the world ever. Just how much they have been here in the U.S. with “Mamma Mia!” on Broadway and in film. – There is clearly a huge demand, “he says. But it’s not as good as it sounds in the Times when we get hold of Benny. He and Bjorn are currently in London to oversee rehearsals of “Kristina from Duvemala”, or “Kristina” in the musical, which premieres at the Albert Hall in April. – All journalists think it is fun to write that “Abba to reunite,” says Benny with a certain weariness in his voice. – That which we said was a joke. Irony. There is no more with it. And then we were back to square one. Yet another defeat for the avid Abba Supporter who want nothing more than that the rumors, sometime, will have little basis. – We have many young fans now, They are very active on the Internet and digging for all articles that could possibly contain something about a reunion, “says Noteboom. But in her eyes is also the risk of failure – that Abba climb up on stage to the soaring expectations and demolishes the mythical image that many have of them today. That’s right, however, Michael Endelman difficult to see. – There is so much to destroy the myth that, at least not here, “he says and laughs at what you get for that is his picture of Abba – in the glittering tights and all that cheesy in how fashion was back then. – Police made a successful reunion tour that people thought sounded pretty good. Van Halen is a little different, they have had so many singers, but still did a thing with David Lee Roth, which was cool. Led Zeppelin made a comeback in London, a show, but wanted people to see more of. – But, he adds. I can not see that it would happen to Abba. We did an interview with Benny when they they were elected into the Rock and roll hall of fame. Where he has just told me that they have said no to one billion U.S. dollars. I do not see that they will change their minds. Do not have a wedding song! The rumor that Abba is said to consider a private performance at the wedding of Princess Victoria and Daniel. Has also been gaining, but agin it is simply not tue! The 2011 ABBA (Unofficial) Calendar! The Telegraph have followed up the article in Friday’s TIMES newspaper with an interview with Gorel Hanser and she sets the story straight! Fans were offered a glimmer of hope when Benny Andersson said ABBA could reunite for a one-off show. However, the group has now apologised for raising fans’ expectations and admitted that the comment had been nothing more than a “joke”. Speculation over a comeback mounted after Andersson and former band mate Bjorn Ulvaeus were asked if they would consider a one-off ABBA performance that could be beamed around the world. But in a blow to millions of Mamma Mia! devotees, the band have swiftly backtracked on the idea. Görel Hanser, the group’s manager, said: “It’s simply not true. “It was a passing comment Benny made, almost as a joke – nothing more than that. “I’ve spoken to Benny and given him a stern telling off. I have told him not to make such ridiculous suggestions anymore. “There is no prospect of ABBA getting back together – it’s never going to happen. I think the fans know that deep down but we’re sorry if we got anyone’s hopes up. The band, who split in 1982, previously dismissed any suggestion of a reunion, insisting they would never take to the stage again. In 2000 they rejected a $1 billion (£600 million) offer to play a 100-date world tour. At the time Ulvaeus, 64, said: “This is the budget of a small country so we had to give it some thought. And two years ago Ulvaeus said: “We will never appear on stage again. There is simply no motivation to regroup. Money is not a factor and we would like people to remember us as we were — young, exuberant, full of energy and ambition. The group, whose hits include Dancing Queen, Take a Chance on Me and Money, Money, Money, has sold 370 million records. Famed for the spandex costumes, they have enjoyed a renaissance in recent years, helped by the success of the film version of Mamma Mia!, the musical based on their songs. However, it remains to be seen whether former female band mates Lyngstad and Agnetha Fältskog would support the idea of a reunion. Lyngstad, 64, who married a German nobleman, said in an interview in 2005 that she had no interest in returning to a music career. Fältskog, 59, has enjoyed a solo pop career since ABBA split but has not hinted at a reunion. Staffan Linde, her spokesman, said that Fältskog was not aware of Andersson recent reunion suggestion. Andersson and Ulvaeus are promoting their new musical Kristina which opens at London’s Royal Albert Hall on April 14. Comments : Comments Off on The Time(s) for Gorel! ABBA ON FRONT COVER OF ‘THE TIMES’! London newspaper the Times, has a great interview with Benny and Bjorn in Friday’s edition of the paper. The boys are in London to oversee rehearsals for the UK premiere of Kristina. They have always maintained that they would never re-form and famously turned down $1 billion (£600 million) to tour again, but Abba have given a new generation of fans hope of seeing the band perform live. For the Mamma Mia! devotees who have come to the band’s music nearly 30 years after they split, tribute bands and YouTube clips of the Swedish foursome in satin and spandex seemed the closest they could get. But in an interview with The Times today, Benny Andersson and Björn Ulvaeus, the male half of the Swedish group, offer a beguiling change of tone. Ulvaeus threw in a reference to the Super Trouper album’s last song. “We could sing The Way Old Folks Do,” he said. The pair’s comments may offer little more than a glimmer of hope, but they are in contrast to previous statements by the band members, who split in 1982. Only two years ago Ulvaeus said: “We will never appear on stage again. There is simply no motivation to regroup. Money is not a factor and we would like people to remember us as we were — young, exuberant, full of energy and ambition. Andersson has also previously derided talk of a reunion. “We’d need a good reason to re-form and I just don’t see one. We could never recreate the old days. I’d rather be remembered for the way we were 30 years ago,” he said. Abba have enjoyed a renaissance. One in four British households owns the DVD of a film version of the Mamma Mia!, the musical inspired by their works. They have sold 370 million records, and sell about three million each year. This year AbbaWorld, an attraction based on the careers of Ulvaeus and Andersson and their female bandmates Agnetha Fältskog and Lyngstad, opened at Earls Court, in West London. Visitors pay £22 for an adult ticket to see costumes that the band wore in 1974 on their way to winning the Eurovision Song Contest, and have the chance to wear a silver jumpsuit and sing and dance with holograms of the band. Ulvaeus and Andersson are promoting their new musical, Kristina, which opens at the Royal Albert Hall on April 14. The production is based on a 2,000- page epic by the Swedish novelist Vilhelm Moberg, but has been changed for an English audience. Abba are thought to have sung together only once since they split. In 2003 they joined in a rendition of a Swedish happy-birthday song at the 50th birthday party of Gorel Hanser, Ulvaeus and Andersson’s manager, in front of about 150 guests. It remains to be seen whether the female members would be interested in a reunion. Fältskog lived as a recluse on a remote Swedish island, saying that she hated fame, while Lyngstad married a German nobleman and is a princess. Please note this is the ‘TIMES’ take on the reunion, Benny is always making a joke of it. So don’t get excited just yet!!! Comments : Comments Off on ABBA ON FRONT COVER OF ‘THE TIMES’! Comments : Comments Off on ABBA 2011 CALENDAR!